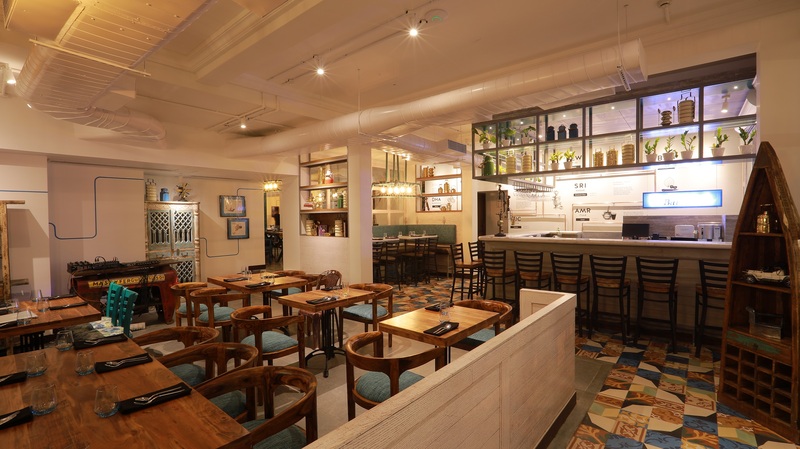 The newest addition to Bengaluru’s burgeoning restaurant scene Bombay Brasserie is an ode to all things India, albeit with a modern twist. And like the food, the environment in which it is housed is contemporary too. I recently checked out what is on offer in its rather extensive menu. The 120 cover restaurant is housed in a refurbished bungalow and is done up in tones of teal and wood that give it a nice earthy flavour. With open dining spaces, al fresco areas, a bar and closed indoor dining spaces, the restaurant is large and airy and has a fun vibe. With exposed ceilings and vast glass expanses, the vivid mosaic floors and signature graphics across the restaurant make this place peppy and young with a vibrancy that is hard to miss. As we settle into a comfortable corner, I am handed over two books (yes you read that right) which I learn are the food menu and the drinks menu! The Patiala Bar (the name of the inhouse bar) here serves traditional favourites as well as refreshing new brews that are presented in innovative containers and mugs! The bar menu is naturally extensive and brings together homemade liquor infusions in Desi Cocktails like Southern Express & Fauji Party Special to Desi Mocktails like Juhu Beach Gola and Not-so-saada; which are all about seasonality, taking full advantage of the wide range of ingredients that pop up across India through the year. I highly recommend you taste the Melon Magic, a mocktail made with fresh orange and musk melon with coconut extract and a hint of chaat powder that packs a big punch in this refreshing drink. Something new are the killer Pauwa Cocktails, 180 ml of desi concoctions, served up in Pauwa, or quarter bottle. These are paired with the right Chakhna – crunchy, tasty bar snacks, specials like Janta Bar – Masala Maar Ke and Kollywood Pop that make it a combination that you want it again! And as far as the food is concerned this is where you re-discover India through an explosion of flavour. You can sample small plates or indulge in large ones, from an eclectic selection of ingredients and pairings that infuse the familiar with the unexpected. As Shikha Nath, Brand Director, Bombay Brasserie, of K Hospitality Corp says, “Bombay Brasserie focuses on flavours that have never been tried before, twisting traditional recipes to suit today’s tastes. We use regionally-sourced ingredients, like aam papad from Amritsar, kashundi from Bengal and malwani masala from the Konkan belt. 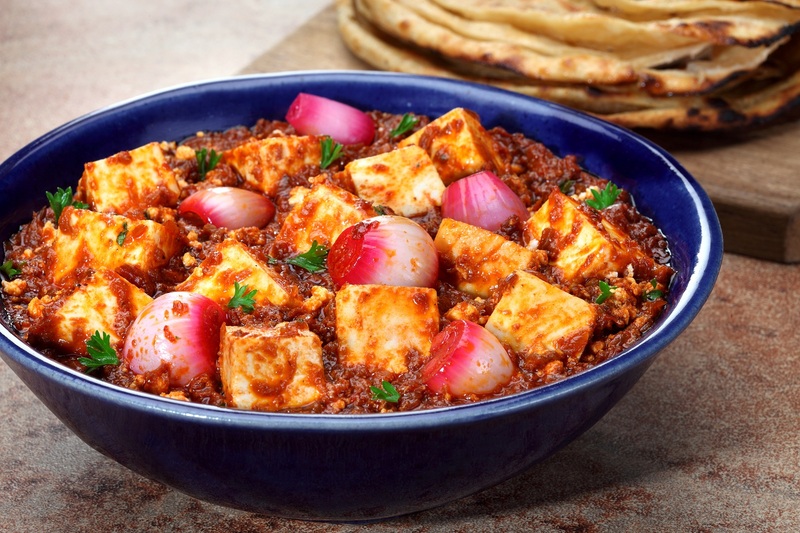 After much research and trial, the menu showcases recipes from across India that are completely unique. Your culinary journey begins here, at Bombay Brasserie.” For starters try the Chilli Cheese Kulcha, a set of four mini kulchas stuffed with cheese and green chillies an ode to Bombay’s famous chilli cheese toast that is so tasty that you will find it hard not to reach out for another. The Aam Papad Paneer is another great starter with paneer and lotus stem tossed with special sundried mango and street food spices directly sourced from Amritsar and is delectable. And if you are confused as to what to try in the large menu, go for the paired curries where you have a curry paired with a roti or rice, with a small accompaniment that enhances the meal. Try the Bombay Lunch Home Veg Curry and Banana leaf Rice that is a great combination of mixed seasonal vegetables simmered in Mumbai’s costal masala and a complex blend of 20 spices served with papad and fragrant curry leaf flavoured rice steamed in a banana leaf. The flavours are simple and the spice level is so right that it lets the ingredients shine through without overpowering it ever. Likewise the Pondicherry Fish with Masala Bread Roll is an ode to Pondicherry’s French Quarter. The pan grilled fish fillets are cooked with ginger in a lemon cream gravy with the bread melts in your mouth. Alternately you could order the dishes separately as well and a one pot meal that works is the Nawabi Ghost Biryani made with fragrant lamb and rice cooked ‘Dum Pukht’ style with Awadhi spices, zaffran and a hint of rose water. Else team the Saali Chicken a tangy chicken curry topped with potato straws with the Chur Chur Paratha a crispy, flaky, layered, hand crushed bread an in house specialty that will leave you asking for more. 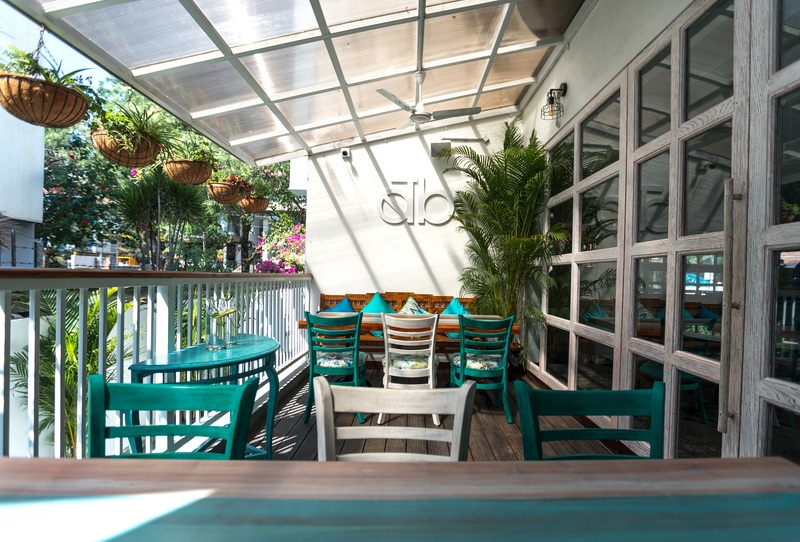 And if you are here at other times apart from lunch and dinner, they have an innovative “High Chai” menu that offers a perfect selection of desi cocktails, beers and indigenous Indian teas with accompaniments like Bun-Paos, Bombay Toasties, Chaats, Small Plates and Roti-Roll-Parathas. And to end this meal on a sweet note, I recommend you try the Bombay Ice Cream Sandwhich which is sure to take you back to your childhood. So you have a platter of biscuits like Jim Jam, Parle G and Bourbon sandwiched with vanilla and strawberry flavoured ice cream served on a slate with gems, éclairs and toffees. And trust me it tastes as yummy as it appears on the plate! The other dessert you must try is the Amritsar Kulfa, which is a kulfi and creamy rabdi on a bed of badam phirni, finished with falooda and a dash of rose syrup which lends the dish a lovely pink tinge. This was the best way to end this perfect meal that was so much fun! So what are you waiting for? Head to the Bombay Brasserie for a culinary experience like no other. Thanks for the feedback Tara, will keep in mind from the next time and share more pics for sure.